I often see patients who have been prescribed powerful drugs to relieve the pain of joint and muscle injuries. These drugs can have dangerous side effects, including upsetting the digestive system and even opening the pathway to addiction. Patients come to me because I offer a better, safer way to relieve this type of pain: Low-Level Laser Therapy (LLLT). This approach uses light from a laser to relieve the underlying inflammation that’s causing the pain, while also speeding the healing process. When soft tissue, such as muscles and tendons are injured, they release chemicals that set off the body’s natural inflammatory response. The area becomes red, swollen, warm and painful. Icing, compression and elevation all help reduce the inflammation, but these are basically first-aid approaches that are only helpful if applied immediately. Even when they are, inflammation and pain will persist for days, or even weeks, after the injury. Drugs such as steroids (cortisone), powerful non-steroidal anti-inflammatories (Celecoxib, Naprosyn and similar drugs), and pain medications (opioids) can help, but their risks often outweigh their benefits. People with diabetes, for instance, can develop dangerously high blood sugar from steroids. Prescription non-steroidal anti-inflammatory drugs are notorious for causing stomach bleeding and even heart attacks. In addition to their potential for accidental overdose and addiction, opioids can cause sedation and depression. Why take dangerous drugs when a safe and effective alternative is available? 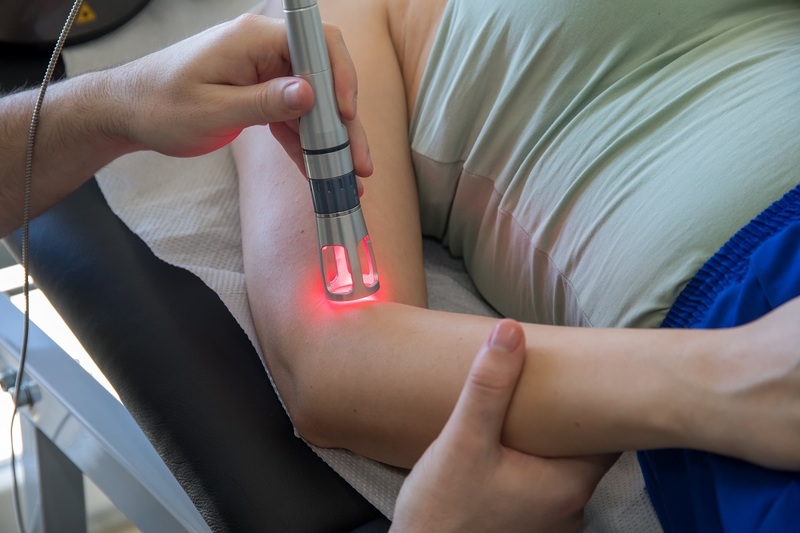 Laser light delivered directly to the area in and around the injured joint can be very helpful for not just relieving pain, but also for actively promoting the healing process. The laser reduces inflammation, provides deep tissue therapy, improves blood flow to the area, and accelerates pain relief. LLLT works by exposing the injured tissue to coherent light at specific wavelengths—in other words, laser light at wavelengths that have been scientifically shown to help relieve pain. The stimulation from the light helps the body use its own cellular resources to heal itself, with no side effects. The light penetrates the skin and into the damaged tissues easily and triggers a biological response that switches on the healing process. The injured area is stimulated to produce a cascade of natural chemicals, such as anti-inflammatory enzymes, that reduce pain and improve mobility in the joint. More than 3,000 published studies show that LLLT is safe and effective. It’s also painless. The photons from the laser don’t generate any heat—this therapy is also known as cold laser light—so they cannot damage any tissue or cause a sensation of heat. The doctor uses a small, hand-held laser that never actually touches your skin. A treatment session only takes three to five minutes. Most people feel less pain soon after the first session and need only two treatments a week for three weeks in a row to get long-term relief. LLLT is particularly effective for sports injuries, such as tennis elbow and Achilles tendon inflammation. It’s also helpful for other types of pain, such as neck pain, lower back pain, plantar fasciitis, and mildly arthritic joints. A really valuable use of LLLT is in treating the headaches and neck pain that come from concussions and whiplash injuries. One of the best aspects of LLLT is that it’s non-toxic—it can’t cause a dangerous interaction with any medications and it has no side effects. It’s also non-invasive—you don’t even have to take your clothes off during treatment. Almost anyone can have laser therapy safely. To find a laser therapist near you, check with your local chiropractors, physical therapists and orthopedic specialists. For the best, safest results, be sure the low-power laser they use is FDA-cleared and delivers light in the 635 nanometer wavelength.